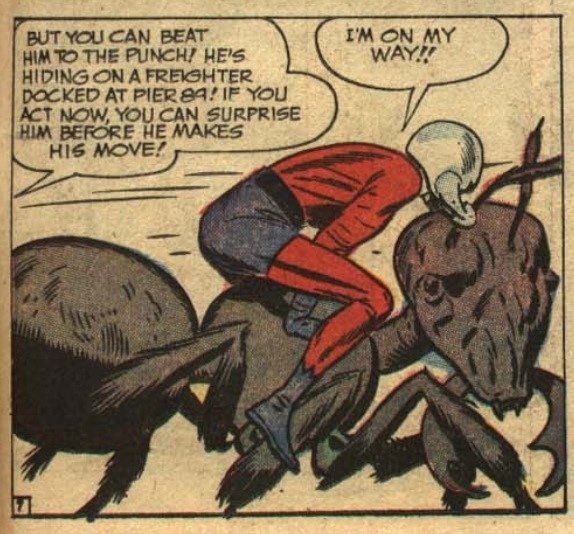 Picking up after that last Ant-Man story, we come back to find that fighting evil doers is now commonplace in the life of Henry Pym – it’s like a second job! In fact, the introduction to the story shows Ant-man saving some crooks who accidentally locked themselves in a bank vault. He turns them over to the police, of course, but everyone is left wondering how he he’s able to find trouble so quickly. 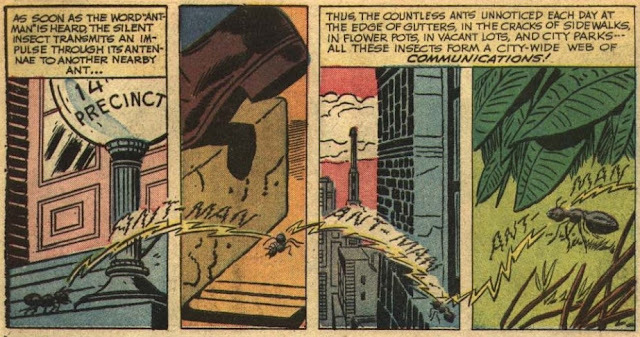 This entire story seems like a device just to show off how he is able to communicate with the ants, and it’s as though each Ant-Man story up to this point continues to advance his story a little further each time. We are faced, ONCE AGAIN, with a bunch of Commies who are up to no good. 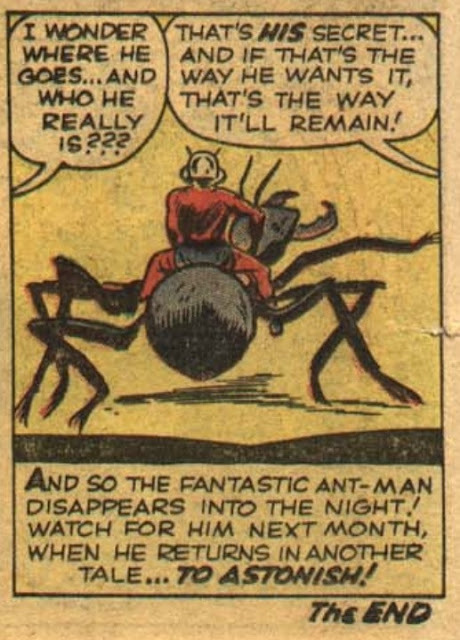 They want to put an end to Ant-Man since he’s now become their main enemy. There’s a series of panels showing a woman pleading with Police officers that she desperately requires the help of Ant-Man. It’s at this point that it’s revealed that the authorities don’t even know how to contact him – he just always shows up. 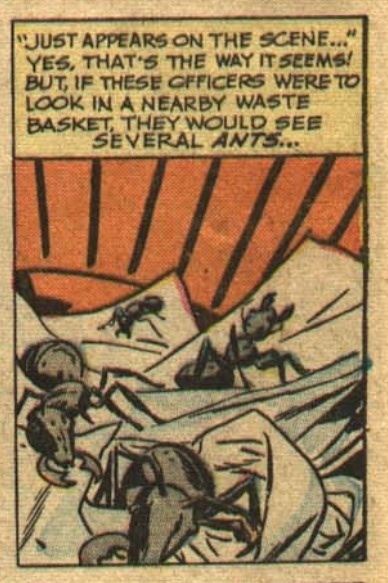 Ant-Man comics always make me want to pretend I’m an ant and crawl around in trash dumpsters after I read them. I wonder if anyone has cosplayed that yet? In a nearby trash can we get a shot of some ants crawling around. This is our first small glimpse of how his network operates. I work in retail, so I’m inclined to wonder: if someone says, “I have enough money to buy another pant, man,” would the ants start sending out their signals? Simply put, each ant acts as a transistor in an overall far reaching ant communication network. Back in his lab, Hank wears his specially designed helmet, and waits for them to pass him any important events they are witnessing. While it might seem a little cheesy, it works, and makes me even more afraid of ants than I already was. Once he’s signaled by the ants that something terrible is happening, Hank gets his suit and uses his reducing gas. 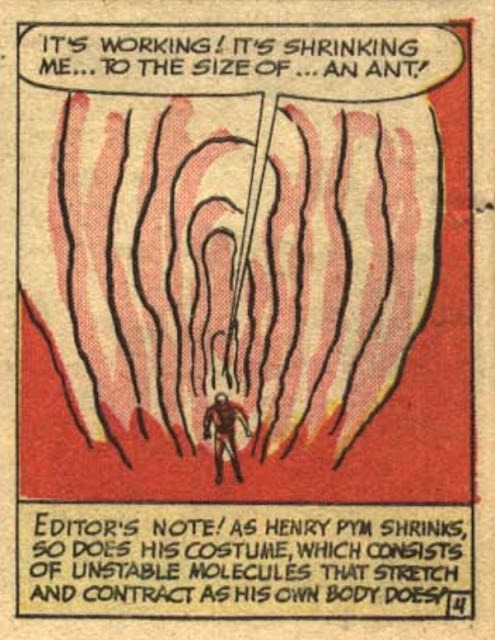 Probably a good idea that the comic isn’t called “Labia Man”. We’re also treated to another thing I love: goofy diagrams! 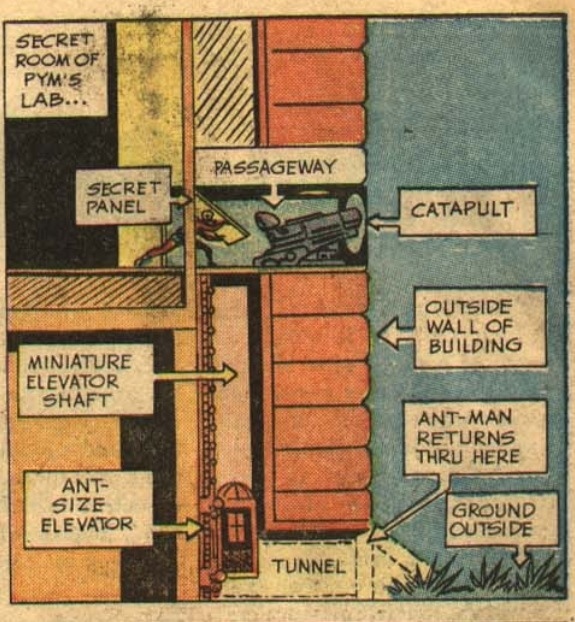 This one shows his catapult and entry system, and of course it’s ant-sized. First rule of being a superhero: you must have an elevator. He shoots out of his cannon, softening his landing on a pile of gathered ants. He also grabs one of the ants and rides off on it to the scene of wherever he’s needed. The scene that makes me glad I’m not Ant Man. 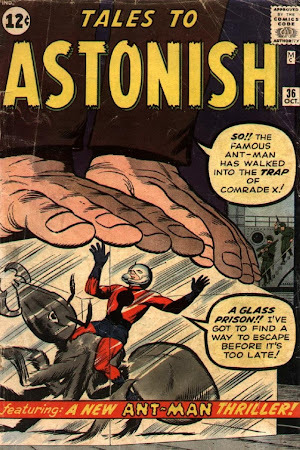 Ant-Man reaches the woman, who reveals that an old flame of hers is a Soviet agent known as Comrade X. She gives Ant-Man his whereabouts, which is a docked freighter. Everything goes as planned and Ant-Man along with his ant army make it onboard. Suddenly a plastic case is thrown over him, trapping Ant-Man inside. It was obviously a trap, but how did Comrade X know he was coming? The ant looks violated. I’m not too sure if I’m behind the whole “ants have rights too” movement yet though. Although he’s encased, Ant-Man is able to still signal other ants, which he instructs to float on pieces of driftwood and storm the ship. Once they’ve made it onto the ship, the ants go FREAKING CRAZY on everyone – biting their hands, legs, and releasing hanging lamps from the ceiling. 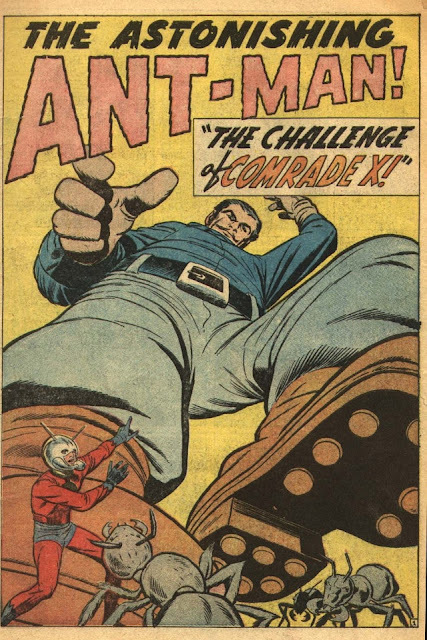 While the ants secure the ship, Ant-Man attempts to sneak up on Comrade X. 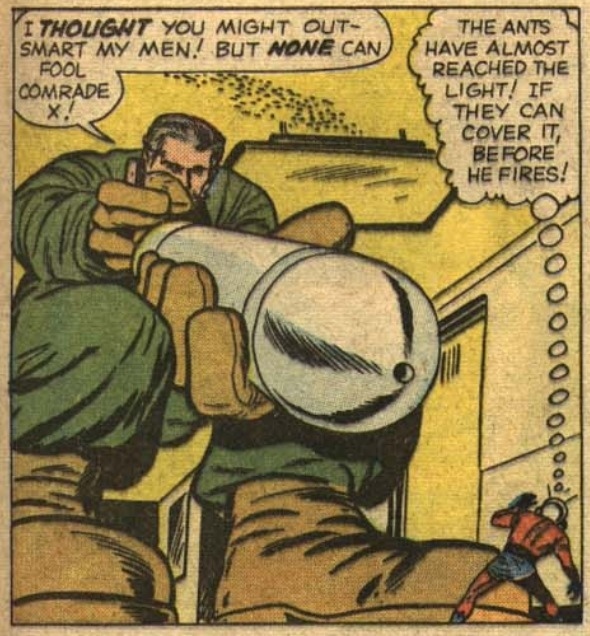 Expecting the bite-sized crime fighter, the evil Comrade X spins around and attempts to shoot of gas capable of knocking Ant-Man out. Hrm…I’m hoping that this isn’t another euphemism. In the knick of time, the craziness onboard the ship catches up to them and the lights go out. 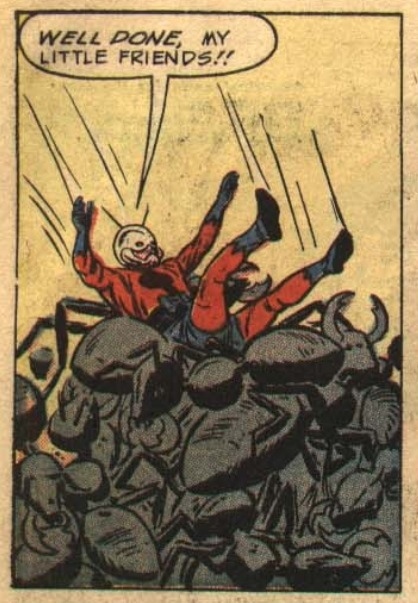 This allows Ant-Man just enough time to tie the comrade’s shoelaces together, tripping the villain, and turning him into a potential feast for ants everywhere! 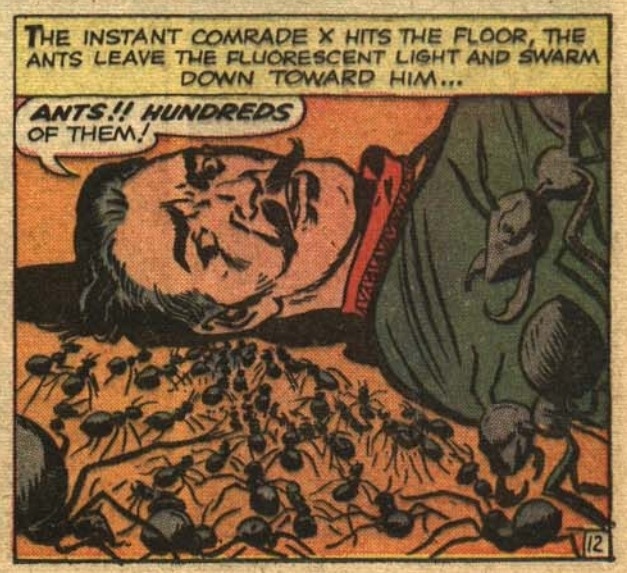 In the process of what looks like the end for Comrade X, the ants pull a “Scooby Doo” on us, revealing that the mustached comrade face was actually a mask. The woman earlier in the comic turns out to be the Soviet spy, and though I entirely expected this, it was still a great scene. 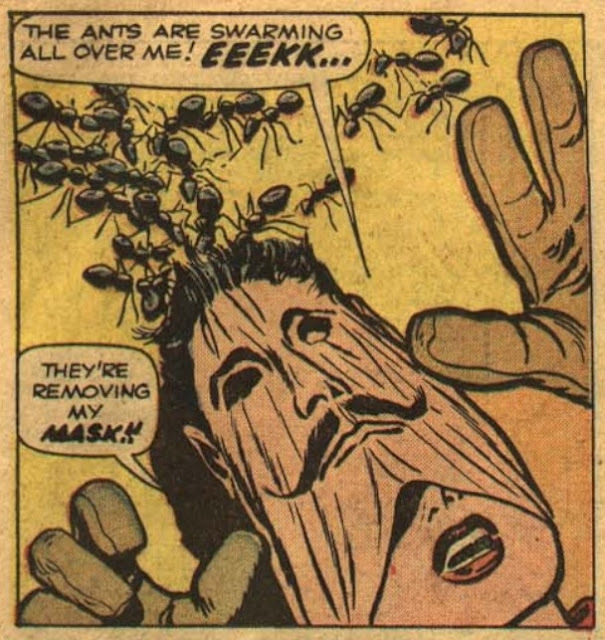 The exciting thing about Ant-Man stories is that they truly live up to the “Marvel” name. I always do feel a sense of…astonishment…when I read these issues. One of my favorite things is the use of perspective, which fills me with wonder and awe. While Jack Kirby was the go-to artist at this time, I feel as though only he could pull this off – at least when comparing him with other Marvel artists of that time period. I know you will probably continue to fight Communism in your own little way Ant-Man, but I can’t wait to see you do it again! as the ant cries desperately for help.